digital investment, your health, and your privacy! Anti-glare, clear, blue light cut, privacy, shock-absorbing, and super scratch-resistant. Photodon films protect screens from scratches, dirt, and abrasion. Many of our films provide excellent anti-glare function while our blue light-cut film helps to protect eye-health. If screen privacy is what you seek, our privacy filters are the way to go. Our shock-absorbing film offers 6H scratch resistance and extreme-grade protection for any screen up to 100 inches. Custom cutting is our specialty. Anti-Glare TV Screen Protectors: Photodon To The Rescue! Touch Your Laptop Computer’s Screen With Peace Of Mind! 6HS: Hard-Core Protection For Flat Screens Up To 80" & Custom Cut! We offer several different Anti-glare screen protectors ranging from 25% to 85% glare reduction, plus one film – 5HS - which is also shock-resistant. Glare Reduction and Screen Resolution: Anti-glare surface treatment has in the past caused some distortion of the screen image but this has been much improved recently. This is most noticeable on white screen backgrounds and if you read fine text or do color critical work. For that reason, you may find that not all screen protector types are listed for all devices. *The terms "anti-glare" and "matte finish" are used interchangeably. Several of our screen protectors are clear, which allows for excellent image quality. 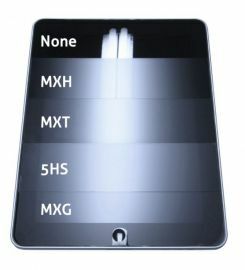 MXO and 9HO have an oleophobic coating, making it easier to clean. * The terms "clear" and "glossy" are user interchangeably. Helps with eye-fatigue, macular degeneration protection, and sleep cycle disruption by cutting a portion of blue light emitted from displays. MXB film cuts up to 93% of high-energy blue light on the violet/blue band from 400-450 nm. These specialty films are highly resistant to blunt force impacts. Both films also feature an extra layer that acts like a shock absorber and has twice the surface hardness of our regular screen protectors. The main difference between the two films is that 6HS is clear, while 5HS features an anti-glare matte finish (85% anti-glare). 9HO is the most scratch-resistant film Photodon carries. This clear screen protector can resist scratching from common objects such as keys, coins, safety pins, and other abrasive materials. In addition, 9HO has an oleophobic coating ensuring a surface that is easy to clean. Like 6HS, it is clear but has a more glass-like touch and is thinner. Mini-louvers embedded in the film reduce screen viewing at a 30° angle, and nearly blackens the screen at about 45°. Photodon offers 2-way removeable and 2-way and 4-way silicone adhesive filters. Photodon’s 4-way privacy filters offer privacy from all directions: left to right and top to bottom. Examples of some device types we cover! I just received your anti-glare film and it fits to the iMac much better than I expected! And works great with my eyes too! It is a great product for new iMac. thanks! Etching onto the screen protector's surface is a sharp and efficient way to promote your business or simply label your film with your name. For a small fee, you can have us etch the film with a company or product name, part number, or website; whatever makes sense to you! The font is 8pt or 12pt in size-your choice, as shown in the photo. Etching location options are right, left or centered along the bottom of the screen. Available on all product pages. EXCELLENT SERVICE! Received the film in two days! EXCELLENT PRODUCT! Went onto my laptop screen just as directed; easy to follow instructions, did not have a single air bubble. WHAT AN IMPROVEMENT -- I can now actually see what's on the computer screen, instead of a mirror image of myself.